An earlier post titled, ‘The delusion of Merit-Hard Work-Ability’ argued that privilege plays a significant role in one’s success and that one shouldn’t forget it. It also argued that privilege comes in many forms. This post presents evidence of privilege as a factor in success. In other words, it presents evidence of factors other than ‘ability’ that play a significant role in one’s success. It is to reiterate the fact that we should be less obsessed with the role of our hard work and ability and acknowledge the influence of other factors. The detailed evidence on the impact of environment that one grows in, on one’s future earnings comes from the ‘Equality of Opportunity’ project. It is led by Prof. Raj Chetty of Stanford University (was earlier at Harvard) and his colleagues. They use huge administrative data of US tax records (4 crore people) and do a granular analysis of the ‘social mobility’ phenomenon. 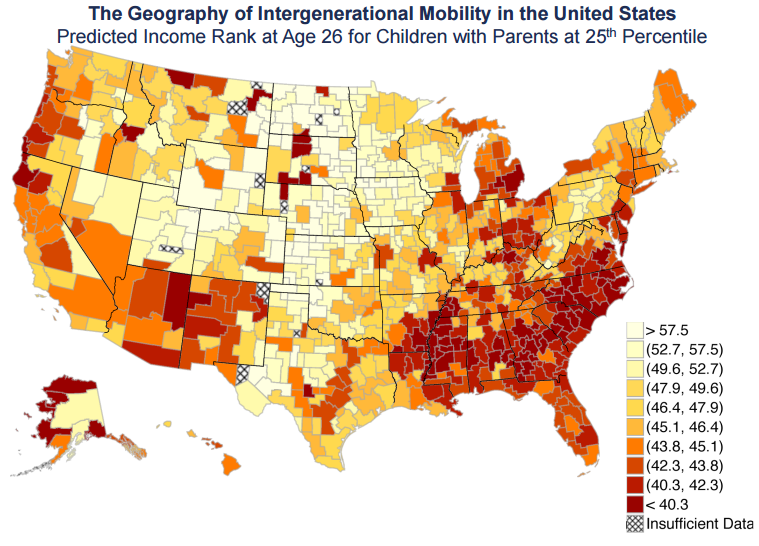 Where does an average kid born in a low income family end up? In an ideal world, parents’ income shouldn’t determine the earnings of the kid. In this world, the earnings are influenced solely by the ability or the hard work that one puts in. On the other hand, if parents’ income (a privilege) determine where kids end up, the data should show us that — a kid born in a rich family ends up in higher economic strata as compared to a kid born in low income family. What does the data show? A graph is shown below. 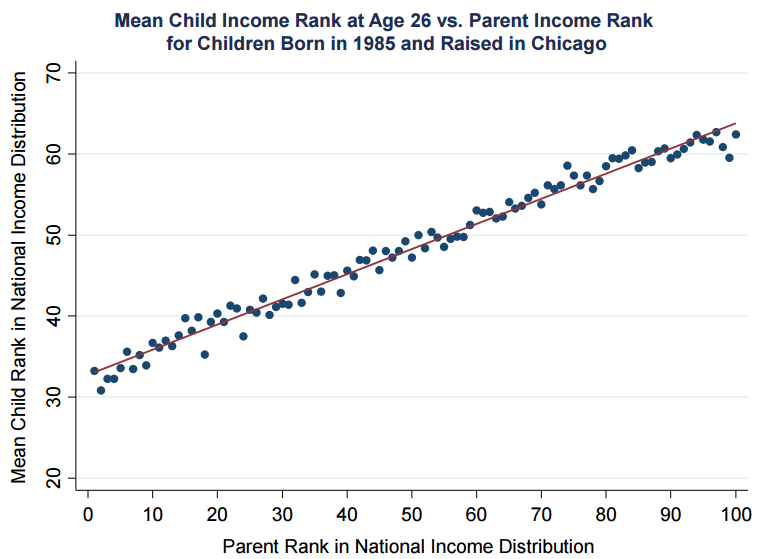 The graph shows a linear relationship between parent’s position in the income distribution and child’s position in the income distribution. I. In other words, richer the family you are born in, more likely that you end up earning more. Point to note: Economic profile of the family you are born in matters for your success. It is a matter of privilege. If you are hardworking and have ability but are born in a rich family, your chances of success are higher compared to a similarly hardworking person but born in a low mobility area. The above finding is at a national level (of US). Are there some areas where the mobility is higher and some areas where it is lower? Chetty & Co plot the granular data of income mobility. US’s map looks as below. The white areas have high income mobility and the red areas have least income mobility. II. If you are rich it doesn’t matter where you are born. If you are poor, living in a low mobility neighbourhood hurts you more relative to the poor living in a high mobility neighbourhoods. The next question is — is the difference in income mobility due to the type of people that live in this area (may be more industrious people live in one area and hence more mobility) OR it is due to the structural issues in those areas? The way to resolve this is to look at people who migrated across areas — either from a low mobility area to a high mobility area or from a high mobility area to a low mobility area. If the mobility was solely dependent on the people’s intrinsic characteristics, migrating shouldn’t change their situation. On the other hand, if it depends on the surroundings, migrating from low mobility area to high mobility area should benefit them. III. If a family moves from a low mobility area to a high mobility area, it positively impacts the future earnings of the kid. Further, the benefits are larger if the migration happens when the kid is younger. Each year of exposure to high mobility areas has impact on the future earnings of the kid. Being born in a high mobility neighbourhood is a privilege and a matter of luck, and that very neighbourhood factor plays a role in success as defined by earnings. If you are hardworking and have ability but are born in low mobility areas, your chances of success are lower compared to a similarly hardworking person but born in a high mobility area. Chetty & Co match the patent records (a measure of innovation) and map it to the profiles of the patent holders’ families. It is to test the influence of parents on their children’s likelihood of getting a patent. They find the following. Kids born in a family where parents have a patent are more likely to hold a patent. The above findings underscore the influence of exposure. The likelihood to innovate and the areas one choose to innovate in, are primarily by exposure rather than ability. Unfortunately, we don’t have good data in India to systemically analyze at a level of granularity as above. However, Prof. Anirudh Krishna of Duke University has interviewed software engineers in few large MNCs in Bengaluru to track their story of mobility. This may be a crude way but the best we can do. In India — Rural vs. Urban, Boy vs. Girl, Caste, Parental income significantly influence one’s odds of success. In other words, being born as a dalit or ST girl in a remote village will almost reduce your odds of becoming a software engineer to zero! The economic profile of a family one is born in, the region one is born in (neighbourhood) and the exposure to certain types of environment (industries, parents’ field of study) primarily drive the success of people. It means that a person who does same amount of hardwork and has the same ability has lower chances to succeed if that person is born in a low income family (in a low mobility neighbourhood), as compared to a similar person born in a rich family, in a high mobility neighbourhood and has good childhood exposure. The family one is born in, the area one is born are a sheer matter of luck and is a matter of privilege. These factors of luck significantly drive one’s success, as shown above. argue for a purely meritocratic distribution. Because, as shown, success significantly depends on a range of uncontrollable factors, that aren’t earned through hard work but are a matter of luck. These are the privileges that one is born with! We better acknowledge their role. You are successful only because you are standing on shoulders of huge privileges which amplify your hard work and ability. Without those privileges, mere hard work and ability may not take you farther.